The Sumners: Life and Times: Crawling Skills! Abigail is working on her crawling skills. 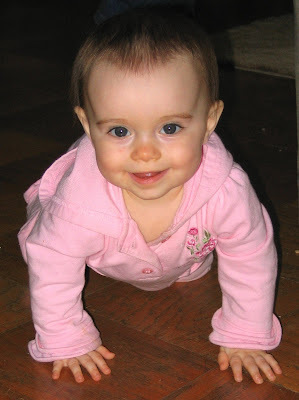 She loves to push up onto her knees, but our wood floors are too slippery to make much forward movement. When we play outside in the grass, she practices moving with her tummy up off the ground. It is probably easier due to the friction -- her knees don't slide around like they do on the wood floors and her tummy creates too much drag to leave on the ground! She has also almost mastered going from her tummy to a sitting position. I have found her completely sitting up in her crib a few times. It won't be long before she is crawling everywhere and sitting whenever she wants!